But she saw the terrible effects of hiding the disease. The lack of health education in schools. The taboos surrounding women’s health issues. “Women were forced to waste their energy covering up their pain and sickness rather than on helping themselves get better. They had access to some doctors, but not emotional support and information,” Nela says. Now, as the regional director of the Women’s Health Empowerment Program (WHEP), an initiative of Federation partner the American Jewish Joint Distribution Committee (JDC) in partnership with the Susan G. Komen Foundation, she works every day to shatter that deadly silence. In 1992, Nela and her family were caught in the crossfire of war, saved only by a JDC airlift to safety in Belgrade. After several years in Israel, she’s returned to fight with JDC. The enemy’s strength is terrifying: Bosnia has about 30 mammogram machines for 2 million women. The national breast cancer mortality rate is about 40 percent—in the U.S., it’s 11 percent. WHEP helps Bosnian women of all ethnicities recognize the warning signs of the disease and know their options if diagnosed, while providing much-needed, culturally sensitive support. Representatives reach out to individuals and communities, empowering Bosnians to take charge of their futures at Health Day events across the country. At a recent Health Day in Kakanj, a small town just north of Sarajevo with a large Roma community, Nela’s team provided breast exams and health consultations, 70 free mammograms and educational materials adapted to their cultural needs, and scheduled doctor’s appointments for 49 women and 20 children. And on national and regional levels, WHEP representatives advocate for better women’s health treatment, organize conferences and facilitate partnerships among government agencies, NGOs and the medical community. 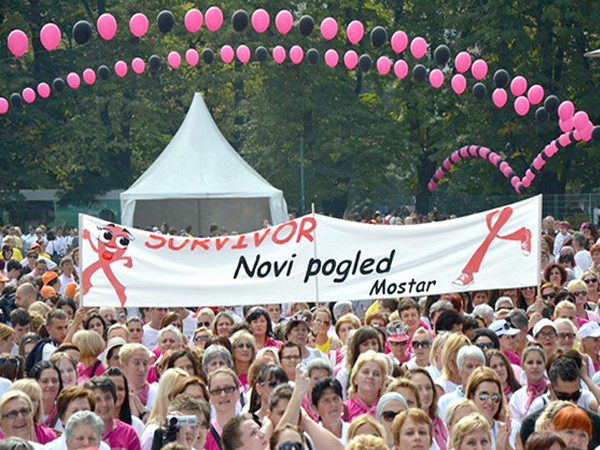 One of WHEP’s most popular public events in Bosnia is the annual Race for the Cure. Now in its eighth year, more than 6,000 people from across the country register and participate each year, and funds raised have supplied free mammograms and post-surgery supply kits, and helped purchase hard-to-find medicine.